Belgium was known to the Romans as Belgica, particularly for the fierceness of its Belgae tribe, which strongly resisted Roman invasion. Eventually it was subdued and absorbed into the Roman Empire. At the death of Charlemagne, Europe was divided up for his three sons at the Treaty of Verdun in 843. Lothair received most of the Low Countries (Belgium and Holland) along with Lorraine, Alsace, Burgundy, Provence, and most of Italy. After this Belgium's history get a little too complicated to relate here even briefly. Its control passed between Burgundian, French, Spanish and Austrian. At the congress of Vienna in 1815, Belgium was reunited with the Netherlands, but gained independence in 1830 as a constitutional monarchy under Leopold I. Ravaged by both world wars in the twentieth century, as was most of Europe, Belgium was liberated from German occupation in September 1944. On January 1st 1989, it became a federal kingdom. Belgium was part of the Benelux area, the ancestor of the European Union, probably heightened by its desire as a small state to avoid further turbulence and ensure the protection afforded by a larger political entity. Because of the legacy of its history, Belgium divides into two main areas, each with its own language and characteristics. In the North, the language is Flemish, similar to Dutch, while the southern part, Wallonia is French speaking. The inhabitants of the central Brussels area would assert that there were three regions. 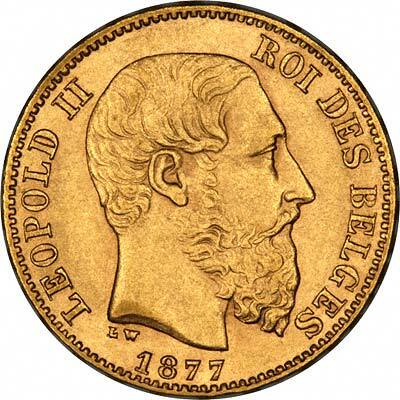 During its pre-1830 history, coins used in Belgium were mainly those of its ruling countries, so that the variety of Belgian coins is quite small. 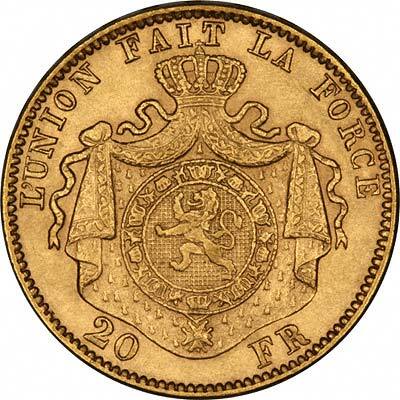 The most frequently encountered gold coins are 20 franc (or 20 frank) coins, although 10, 25, and 40 francs were also issued. In more recent times Belgium has led the way in producing ECUs and Euro coins. Some of the coin issues have two distinct varieties, with French and Flemish inscriptions. The coins with French inscriptions show the denomination as (20) Francs, and the obverse inscription ...Roi des Belges, while those with Flemish inscriptions show the denomination as Franks, and the title as ...Koning Der Belgen. We are just in process of splitting our Belgian gold coins page into several subsections, each covering a different type of coin. Belgium also issued a number of ECU issues, which are now listed on their own page. Bare head of King Leopold II facing right. Crowned arms of Belgium with a central lion rampant. Gold Content = Fine gold content in troy ounces. * = Subject to fluctuation with gold bullion prices, please agree prices by telephone before sending order. For investors or collectors wishing to buy 20 Francs in quantity of 10 pieces or more, we can usually quote very competitive bullion rates on request. For silver and base metal coins of Belgium, please look at our original Chard Coins website. We make an active market in almost all world coins, gold or otherwise, including Belgian gold coins, whether listed on this page or not. If you have any of these coins to sell, please contact us, or post them to us for appraisal and offer.